A genius of performance art, an exuberant space oddity, is no longer fallen to Earth: Davie Jones of London is gone, but all-Earth David Bowie rises from the grave, through “Lazarus” (the music video) and “Lazarus” (the play). Michael C. Hall, who stars as the extraterrestrial Bowie stand-in, in the play notes what many note: that, ironically, this performance master was “a very private person” [NYTimes]. It reminds me of Andy Warhol, media daimon, whose loft above The Factory seldom saw visitors (and whose furnishings were classically European). The work of art was essentially psychological, rather than musical or visual. The Times notes that “his musical and visual palettes continued to evolve, always theatrical and deeply layered,” yet the more salient truth is rather converse: The theatrical palette continued to evolve, in musical and visual “terms,” “appearing in many guises, shapes and forms” [PBS News Hour], “reinventing himself as many personas” [NYT], especially salient, during the ‘70s and ‘80s, as the “androgynous look” [PBS]. 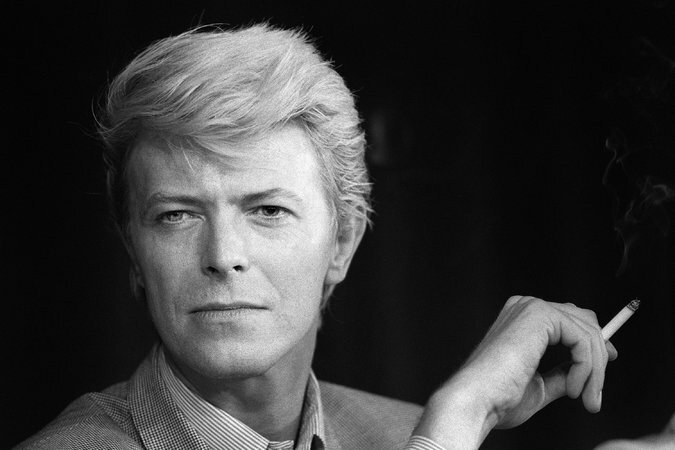 “He explored androgyny and otherworldliness” [NYT]. “Ever-changing...constantly changing, but somehow always uniquely himself” [PBS] is how it goes for any essentially-dramaturgical sensibility. Says Anthony Decurtis of the Rolling Stone [PBS]: “This idea that you could continually reinvent yourself, that every time you stepped out on the stage, it was a stage, and which character are you going to be playing? That was anybody’s guess. 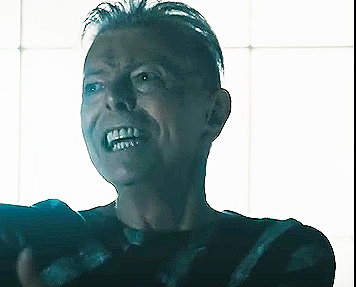 Bowie never seemed old. That sense of reinvention really made him seem of the time at every time”. So it may go, too, for stepping out into any morning. For some, all human reality is theater. So, what’s a little mirroring through art? But David was not despairing! The art may be never gone. While “Lazarus” (the song) begins with “a man in total distress, [he’s] finding a way out, in his imagination, so he could still be alive, in freedom, as a bluebird,” says van Hove. Few knew that David was to die soon, because he wasn’t dying. Still the man of, say, 1983 (below), two years older than me, I confess—and I never smoked (and I don't much like his deathbed song. P. S. Here’s some allegedly “rarely-seen pictures” of the man—and an article on his love of painterly art.